The Vertical KM race in Fully, Switzerland is considered to be the fastest vertical kilometer course in the world. 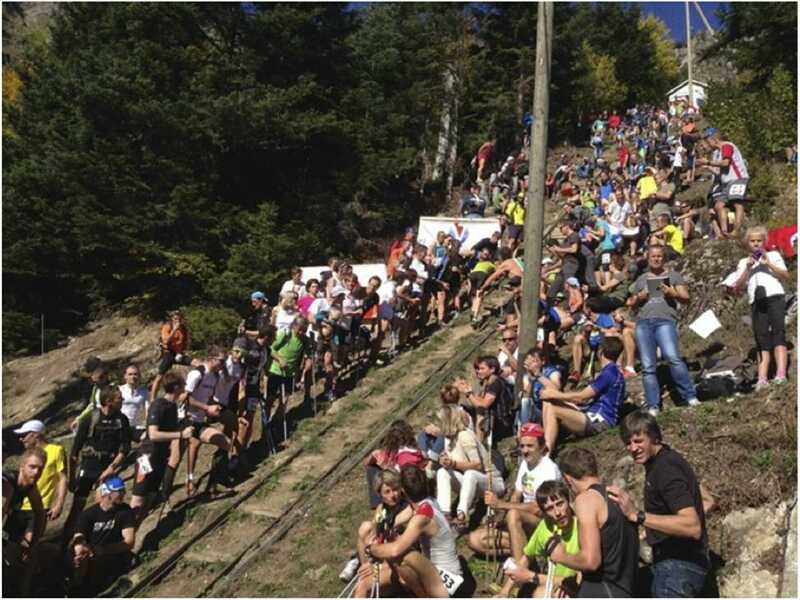 The race, held on a former funicular route, is home to both the men’s and women’s world records. This past weekend, temperatures were too warm for a new world record. But, nonetheless, a great race was had by all, with clear skies… and none of the snow that had covered the course just days earlier. We’re pleased to offer a recap of the event from Caroline Grange, a member of the Fully Vertical KM Race Committee. Thanks Caro! Straight up! A view of the Fully race course, held on the site of an old funicular route. Photo courtesy of Philippe Bourgine. This thirteenth edition almost required crampons and ice axes–something some crazier runners have tried, in the off season! But the snow slowly disappeared a few days prior and the sun was out in full force on the big day. The prospect of snow and ice didn’t scare off the racers, who are some of the best in the world. They came from Italy, France, Germany, Sweden, Holland,… all in search of an extreme challenge, which is how they came to find themselves here in Fully. Each contestant was looking to push the limits of his or her body and mind to the very farthest point. The excellent atmosphere along the course helps carry the racers up the extreme route to the finish. Though the race fills quickly each year, this year’s event filled in a record time. In 8 hours all 600 registrations were taken. We expect it to be even more difficult to register for next year’s race. It was a bit colder, the week before the race! Photo courtesy of Olivier Abbet. There were no speed records in this year’s race, however, as it was simply too hot. “Usually I don’t perspire that much, but this year I was sweating from the very start,” one racer told me. Indeed, meteorological conditions were perfect for the spectators, but too warm for the participants. This thirteenth edition was a big success and the race committee thanks all our many volunteers and participants. We look forward to seeing you for another edition of the race, next year! Onlookers cheer on racers at the top of the Fully race course. Photo courtesy of Didier Ançay.